Mercedes-Benz has launched a totally new SL to replace the previous model. 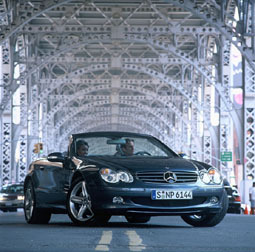 A technological tour-de-force, the 2003 SL is improved in every way over the 2002 SL, which enjoyed record sales last year in spite of its 12-year-old design. The new Mercedes SL is a sinuous, sensuous roadster with dramatic styling. Press a button and, 16 seconds later, its retractable power steel roof changes it from the open-air fun of a convertible to the quiet comfort of a luxury coupe. The SL is packed with every bit of automotive technology that Mercedes has perfected over the past dozen years, and that's a lot of technology. It does everything well, assuming you like to travel light because there's not much luggage space. 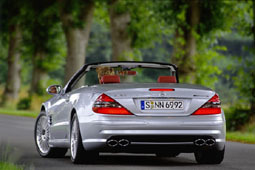 Two models are available for the 2003 model year: SL500 and the ultra high-performance SL55 AMG. These will be followed by the top of the line SL600 next year. All come loaded with everything a driver and one passenger need for grand touring, from the Bose stereo to the beautiful new interior decor. SL500 ($85,990) has more standard equipment than just about any other two-seater in the world today. The SL500's 5.0-liter V8 engine develops 302 horsepower. 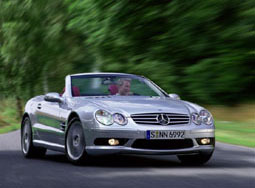 SL55 AMG will be introduced in fall 2002 as a 2003 model. Brimming with performance, the SL55 AMG uses a newly developed, hand-built, 5.5-liter supercharged engine with more than 465 horsepower to catapult itself from 0 to 60 mph in just 4.5 seconds, making it the fastest production Mercedes-Benz ever. The SL55 AMG comes with racing-derived braking power. Immense vented brake discs and calipers are engineered with the industry's first electronic braking system, stopping the SL55 AMG with racecar-like ability. Similarly, the SL55 AMG uses a further evolution of Mercedes' ABC active suspension to imbue the car with cat-like handling reflexes while simultaneously offering ride comfort designed to surpass the competition. SL600 will be introduced next year with a silky smooth 6.0-liter V12 engine. Options include a Motorola Timeport telephone, voice activated controls, the Parktronic parking distance warning system ($1035), Distronic radar-based cruise control ($2950) that keeps a preset distance between the SL500 and the car ahead, a tire pressure monitoring system ($630), and several seat options. Also available: Bi-xenon high-intensity discharge high- and low-beam headlamps ($900); Keyless Go ($1015); Panorama Roof ($1800). SL1 Wood Package ($840) includes wood and leather steering wheel and shift knob. SL3 Comfort Package ($1520) includes ventilated seats with multi-contour seatbacks. SL2 Sport Package ($5100) includes AMG Monoblock alloy wheels, high-performance tires, body-colored AMG-designed front air dam, side skirts and rear apron, and the ventilated seats with multi-contour seatbacks.